Business phone service for manufacturing companies. Working in manufacturing requires a mix of many business tasks: sales calls, working with suppliers, managing staff in multiple locations, and coordinating delivery and distribution. These are all equally important parts of this industry that require consistent, clear communication from start to finish. Call 877-630-0914 to learn more. What do manufacturing companies need in an office phone system? Many manufacturers tend to do business internationally, so free/unlimited or low-cost international calling is usually high on the priority list when looking for a business phone solution. With Ooma Office, all calls to the U.S., Canada, Mexico and Puerto Rico are free and unlimited. Ooma Office also offers competitive rates for international dialing. Manufacturing companies will also likely require many extensions and ring groups under one business line, so choosing something low-cost and all-inclusive is a must. And, because manufacturing companies are different in size and business needs, their business phone systems must also be customizable. See how this software solutions manufacturer modernized their business phone communications system with Ooma. 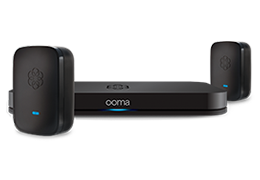 We love that we didnt have to alter our network at all to install Ooma Office. Combine that with all the customizable features it offers, and we have a solution that perfectly adapts to our business needs. All-inclusive pricing: Business phone service is simple and straightforward with Ooma. All enterprise-grade features and low international rates are offered to Ooma customers at no additional cost. Low-cost international dialing: Manufacturing companies who do business with international partners, clients or suppliers can enjoy free and unlimited dialing to Mexico, Canada and Puerto Rico, and enjoy competitive international rates to other countries around the globe. Virtual receptionist: This feature keeps you looking polished and helps you stay organized. Create business hours and afterhours settings, greet suppliers and partners, and direct calls more effectively. Use your smartphone: Great for managers on the go, the Ooma Office Mobile App allows you to take calls from your business line on your smartphone. This helps you stay mobile and ensures you’ll never miss a call. Visit our office phone system page. to view additional case studies and customer testimonials, get information about office products, and see how much you can save by making the switch to Ooma. Find out more about Ooma’s features and benefits for manufacturing companies by watching the video below. Whether you’re a local or national business we can help – Ooma is the #1 VoIP solution for a variety of business industries.